Lying along a network of boroughs, the lagoon of Venice has not lost its erstwhile charm despite having embraced modernity with open arms. Though the tourists outnumber the locals at any point on a given day, the city remains a fantastic holiday destination with its rich cultural history dating back to the 14th century. The skyline of the city consists of turquoise house-tops amidst towering mansions, museums, monuments and exuberant Cathedrals. 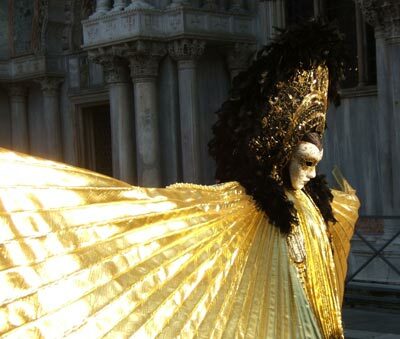 Touring Venice with our affordable car rental services will let you absorb the Venetian culture in style. Pay a visit to the Basilica de San Marco while you are in the city. This sumptuous cathedral is the prime landmark in Venice and the most important church in the city. Its architecture is a unique collaboration of various styles from the Byzantine to the Greek to the Arabic to the Roman. The large mosaics are a major feature and cover about 40,000 metres, giving it a unique feel. Besides this, you have several Chapels and prayer services inside the Cathedral. What served once as a watch tower for the maritime Grand Canal is now a beautiful tower – the Dogana da Mar – offers picturesque views of the San Marco and the Ducan palace. You can charter yachts or take a ferry across to the islands nearby and spend a day in by the sea. San Giorgio Maggiore is a wonderful island just a few minutes away from the Mar tower. Comprising of two major landmarks in its vicinity, the Gothic Cathedral and the fabulous Renaissance-style Grade di San Marco mansion, the Campo Santi Giovanni is a huge city square in downtown Venice. When you are through with exploring the lovely buildings, stroll across the various palazzos, the cafes and promenades featuring lovely antiques for sale. With our car hire services, you can tour around Venice and view many more magnificent structures like the Bell Tower, The Riacco Bridge and others. With a striking history spanning more than fifty decades and an art form celebrated across the world, it is obvious that Venice is home to a huge assortment of museums, each with their own unique displays. You must visit the Correr Museum, the Peggy Gugenheim Museum and the Ca Rezzonico Museum for the sheer brilliance of their construction and the rare artefacts they house. The Cheisa de san Barnaba is another must-visit attraction in Venice with a complete display of Leonardo da Vinci’s machines and instruments in complete prominence. The affordable car rental services we have enable you to do as much or as little as you like in the area around Venice. Rentalcargroup.com offers car rental in more than 35000 locations, at all major airports and cities and railway stations. Below on this page you see a map with all the car rental companies we work with in Venice. Last month, the average car rental length in Venice was 6 days. The average rental car length in Venice is 6 days. The most booked rental car type currently in Venice is ECONOMY cars. Last year, the most booked rental car type in Venice were ECONOMY cars. How much does it cost to rent a car in Venice? Last month, the average car rental price was 203 USD. Last year, how much did it cost to rent a car in Venice? Last year, the average car rental price was 176 USD. What is the current average daily price to rent a in Venice? Last month, the average rental price was 36 USD per day. How much did it cost to rent a car in Venice over the past 12 months? Last Year, the average rental price was 29 USD per day. The car rental companies available in Venice are: Green Motion, Maggiore.